What if … you connect yourself? – Let's dance through life! Having connections, being connected, getting new connections – it seems to be something which just pops up everywhere, all the time and in all areas our lives. It became so easy to connect to family and friends who live far away, to connect to other mothers, to connect to people with same interests, to connect to like-minded people around you. Having connections is very much a must for doing businesses in various cultures. Technology, social media and platforms with the purpose to connect make it easier than ever before. I guess nothing new. New to me that I’m in a (new) not so new position since one year as an Educational Technology Coach and I find it very challenging to understand why educators don’t want to connect more than with educators physically around them. What do they fear? Why they don’t want the benefits and the joy of being connected professionally? Do they feel overwhelmed? is it just something they are not used to? Or do they just don’t know and someone has to open their eyes like it happened to me around 5-6 years ago? 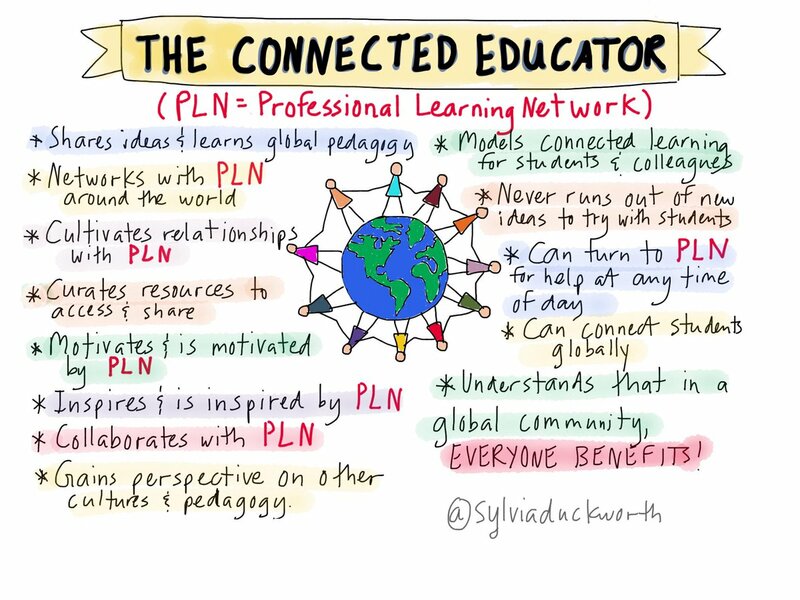 Inspired by Jeff Utecht’s Blog post “Introducing the Connected Teacher”, a great Sketchnote of Sylvia Duckworth as well as the new “ISTE Standards For Educators” several questions came up. Sylvia Duckworth sketchnoted her ideas of a connected educator. Important for me – being connected online and offline. I love to be connected to other educators around me at school and have face to face conversations. Unfortunately, it isn’t always easy to find like-minded and like-passionate people in the offline world. You know who you are – thank you for inspiring me so much! I really appreciate that Jay Thompson set up a Singapore edTech Network and I hope we will continue exchanging good practice. Conferences – small or big – are a great chance to connect and I love it. There are way more opportunities online: Twitter, Twitter chats like #whatisschool, #istechat and so many more, and the education resources on the social media seem to be endless like Commonsense Media, ISTE, seesaw teachers on Facebook, again – and so many more. If you can’t attend a conference somewhere on the world, it’s enough to sneak in on Twitter or Google+ to enjoy the sharing. Any time, anywhere, as long as you want and 100% personalized. All gives you the chance to learn, to share, to inspire, and to get inspired. It can be a starting point to create wonderful relationships and to innovate learning together. In July 2017 the new ISTE Standards For Educators came out which are defining standards for learning and teaching with technology. What do the ISTE standards say about being connected? creating and actively participating in local and global learning networks. But how can I promote the connected educator and learner at school in order to open the possibilities to benefit student’s learning by connecting students to other students around the world? I feel like I need to set priorities. Everything at the same time is not possible. Our school started using Seesaw (A student driven portfolio platform) last year and this AY 2016/17 all classes in KIGA, Preschool and Primary School will use Seesaw as the portfolio platform. Learning right in time, not just in case. … more will come up. My Goal: If someone experiences how beneficial it is to be connected the next steps to get connected isn’t that far. Maybe somebody then is also open to connect his or her students through the blog on Seesaw to other students around the world. Somebody using Seesaw in Germany or a German School abroad? Learning just in time versus just in case. great post. Do you mind sharing it in the first e-briefing for our staff? It baffles me too. I’m being looked at as if I’m a social media addict. I’m not, but I have the need to exchange ideas and learn. Sometimes I believe it is the fear of the unknown. Will I be able to contribute? How much will I have to disclose about myself? Previous PostPrevious Spoil yourself with excitement!